And now the hard work begins. On Dec. 19, Engine, a Biddeford based nonprofit organization, became the new owner of the former Reny’s building on Main Street. The idea behind Engine is that artistic creativity will lead to economic revitalization. Tammy Ackerman and her partner, Joshua Bodwell, are both founders and directors for the non-profit organization. They, along with their board of directors, hope local artists and artisans will play a significant role in changing the face of the downtown area. 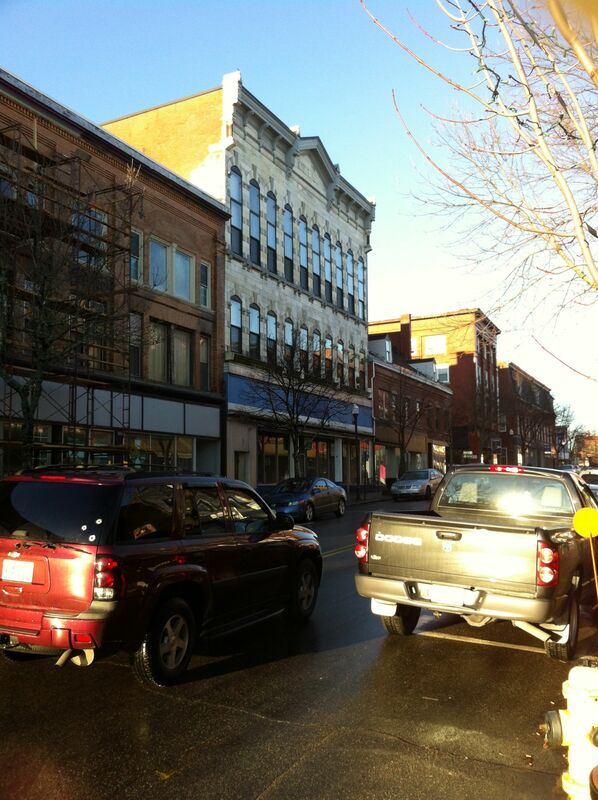 Ackerman, herself a resident of downtown Biddeford, knows the building well and has high hopes for the area near 129 Main St.
“I hope the building can become a centerpiece for the area and the city,” she said. “We are so grateful to the Reny family. Reny’s occupied the building for 20 years, but left Biddeford in 2005 and moved to the Shaw’s plaza in Saco. According to the company’s website and Ackerman, it outgrew the Biddeford space. After moving across the river, the Reny family and the company tried to sell the Main Street building. According to city tax records, the land and building were assessed a value of $311,300. But as the real estate market turned, no one seemed interested in a building that was more than 100-years-old. For more than 6 years the building remained vacant. Ackerman lives nearby and saw the building almost daily. As a director of Engine and the president of The Heart of Biddeford, a non-profit organization whose mission is to revitalize the downtown section, she began to wonder about the possibilities. In 2010, after receiving a portion of a $50,000 grant from the Maine Arts Commission, Engine’s board of directors decided to approach the Reny family to see if they would be willing to donate the building to them. Ackerman did not have a previous relationship with the Reny family, but after speaking with Mary Kate Reny, she discovered that they both had a passion for downtown revitalization. Engine had enough money do some basic maintenance and start a capital campaign. The funds raised will be used for renovation and maintenance, but more importantly, Ackerman said that she and her board are filled with a vision for the old building. Within a few weeks they did and the family agreed to donate the building, she said. At the time they decided to speak with the Reny family, Engine was already heavily involved in the renovations of the vacant space at 265 Main St., the building formerly occupied by Potter’s Furniture. Using a combination of private funds and state and federal tax credits, owners Caleb Johnson and David Flood are working to turn that location into a combination of retail and residential space and Engine currently occupies gallery space on the first floor. Flood said that many people around the city have noticed the changes that are taking place at that end of the street. “If the redevelopment of the building does what it is intended to do, that new venue will trigger other investment in that area,” said Mayor Alan Casavant. Because the building is now owned by a non-profit organization, the city will not collect property taxes from the owners, but Casavant does not see this as a problem for Biddeford. “One could look at the loss of tax generation as an investment in future development. In this economy, city government, businesses, and non-profits need to work together, so I project this project as being a “win” for the city,” he said. Casavant said other cities and towns throughout Maine are becoming aware of the overall economic impact downtown revitalization can have on other local organizations and companies. He mentioned that through revitalization municipalities have the opportunity to build and strengthen relationships between other local institutions and the city or town. He specifically spoke of the way students from Bowdoin can be seen at the shops and restaurants throughout the downtown Brunswick area and wondered if that type of relationship could happen in Biddeford with the students, professors, and parents from the University of New England. “You just need people with energy and vision,” he said. Ackerman has reached out to the University of New England and the school has become involved at Engine’s 265 Main St. location. Professors from the art Department have used the space to create and display some of their work. Both Ackerman and the mayor hope they will also be part of the renovated Reny’s building. Dean Wolfahrt, president of McArthur Library Board of Trustees and longtime Biddeford resident, has watched from across the street as the former Potter Furniture building at 265 Main St. has been transformed into a space for creative enterprises. The library recently went through renovations of their own and now Wolfahrt and the library staff are watching as the same type of work takes place across the street. He is hopeful the work will continue on at the former Reny’s location, but both Wolfahrt and Ackerman know it is not easy to refurbish an older building. “It always seems to take longer and cost more,” Ackerman said. She went on to say that the space that Engine occupies now was supposed to be finished about a year ago and at this point, it should be finished by the end of Jan. 2012. Ackerman does not have a specific budget for the renovations of her building yet, but after having it inspected and reviewed by an architect, she feels that it is structurally sound. Because of a leaking roof, the current electrical system on the first floor is damaged, and Engine is now using some their grant money to repair both the roof and the electrical system. Engine recently started a $50,000 “Marble Block Challenge” capital campaign and most of funds raised will be used to carry the non-profit organization through the next two years as they work to develop specific renovation plans. At the same time, Ackerman and the board of directors of Engine have seen the renovations at 265 Main St. first hand and hope to replicate the successes there. According to city tax records Flood and Johnson bought the 265 Main St. property in Jan. 2011 for $275,000. In 2010, Biddeford was designated as a historic district, and Flood said that because of this, companies such as his may now use state and federal tax credits to make their development projects economically viable. Flood said there are many historical buildings along Main Street like his. “The marble facade and the general architecture of the Reny’s building may make it the most striking building downtown,” Flood said. Flood paused for a moment as he spoke about both sections of Main Street. “Every building helps every other building,” he said. Flood, like Mayor Casavant, said he is not alone in making a connection between his building and the rest of Main Street. “We all can see what is going on,” he said. “ The Bank (Biddeford Savings) is happy. Paquin and Carroll is happy, and that only helps us attract businesses downtown,” Flood said. Ackerman shares this sentiment and hopes that by making the former Reny’s building an example of modern architecture combined with an emphasis on passive energy, it will create a space that will last for another 100 years. Ackerman has spoken with many groups about ideas for the building, but she would like to see a commercial or retail tenant on the first floor that is somehow related to the arts community. “We want the public involved,” she said. Engine plans to hold an open design and planning meeting in late January or early February. Ackerman said they want to create a space that is connected to the community and through the arts they will promote innovation. She does not have contracts or tenants yet, but envisions a space that may contain a market for local artisans, design and production companies or even a space that contains a fab-lab of sorts. “I am fascinated by the idea of a fab-lab,” she said. Professors at MIT who wanted to create an environment where people would have easy access to modern means and technology for innovation and invention came up with the idea for fab-labs. But Ackerman realizes the pace of change for her and the building may be slower. “If we have to go one floor at time we will,” she said. The building itself may not be ready to occupy until spring 2013, but Ackerman said Engine would be one of the first organizations to move in. She hopes momentum is on her side and others will be there with her. “How we get from the concept to reality – that’s the challenge,” she said. “The instant criticism is that you can’t survive by just selling a couple of paintings. It’s not about that. It’s about the interest the arts generate. It’s about the vitality that you create that will attract other people. That’s what I want to do,” she said.